I’m not a brilliant person. I think really smart people have a lot of headaches so I try to enjoy each and every day, laugh a lot and let the big things go. Really, I laugh a LOT and consider myself mildly funny, married to the Golden Goose, who is really funny and avoid serious stuff like the plague. Like changing oil in the car or rotating tires, it’s just not fun and I avoid it. Thankfully, I have the Goose or I’d be in a pickle. I am deeply lodged inside my Lilly Pulitzer colored world and probably needed what I got a while back. I got a good lesson in not judging a book by it’s cover. Or not judging a man by his looks. I could continue this thread on down by not judging a woman by her shoes, but let’s not get crazy here. I get a lot of calls from people who have found injured or orphaned animals. I must admit that when I started 10 years ago, I loved these calls. I would talk and talk to the nice folks who were calling and by the time they left after dropping the critter off, I’d know everything about them, would have walked them around the barnyard, introducing them to each and every one of my animals and they would know the most minute and intimate details of my life from my childhood to my recent botox injection. Now, when they call and begin the sentence, “hello? I got your number from …” and they start to fumble for where they found me I am already sighing and interrupting with “what do you have?”. I guess the shine wears off anything after a while but I must say that middle-age has made me, well, snippy sometimes. This has caused an uptick in wine consumption, which, in turn, has caused more wrinkles and more calories. Anyhoooo, a while back, I was in the middle of a particularly crazy day. I do have a real life, as a designer, and sometimes still manage to get dressed up and work with people. This day, I was clean, had had coffee (those who know me are nodding and saying “nuff said” here) and was running out of the house when I got a call from a man who proceeded to stammer through his problem while I twisted and fidgeted thought his long explanation. I agreed to wait. 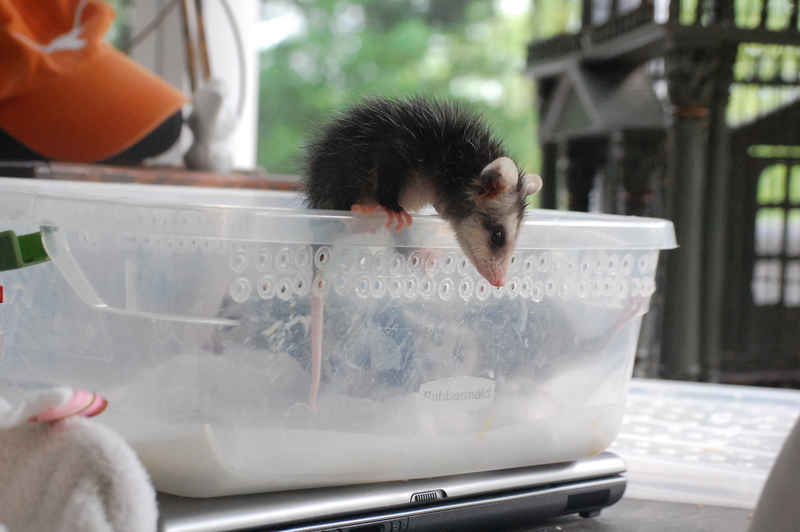 It seems he had found a baby opossum and had driven it all the way up to Amicolola, about 40 miles from me. They then told him to take it to Gainesville, another 40, at least. They gave him my name and he headed back my way. This man called me at least 3 times on the way, shouting at me over the phone while I, again, gave him directions, articulating and snapping like an angry governess. When this man finally arrived I was shocked. He drove through my lovely gates in the biggest beater of a car I’ve ever seen. The doors were not the same color as the rest of the car. There was no back window. The man who emerged was dirty. Filthy. Encrusted in dirt. His hair stood out at all angles and, when he smiled, there were a good many teeth missing and the ones remaining were, well, dark. In his shirt, against his body, he had a tiny opossum curled up snug and warm. When the man spoke, he was slow and quiet and I realized that when he had called all those times, it must have been from pay phones. He trembled a bit as he handed over the baby and explained that he was so sorry it had taken so long, he had had to go by his sister’s to get some gas money. He then tried to give me four crumpled up bills to help pay for food. Now, it takes a lot to get to me. I see a lot of sweet things die, I see horrible injuries and have learned to grit my teeth and just move on. My eyes filled with tears and I looked down at my fabulous shoes, in my pretty yard, by my nice car and in the shadow of my comfortable home. Here was a man that people probably look away from in public out of fear or disgust. He had nothing and had had to borrow the money as he drove about 150 miles in the hopes of saving what most people consider a disgusting rodent (do I really have to add here, again, that opossums are marsupials, just like kangaroos?). He then offered to help pay for his care, something that most people that drop off animals in Mercedes and BMWs never even consider. He said he had worried all morning about keeping him warm and making sure he had a good chance. How many men would take the time to do this? This isn’t the funniest of stories and about as deep as I go, but I think about him all the time. 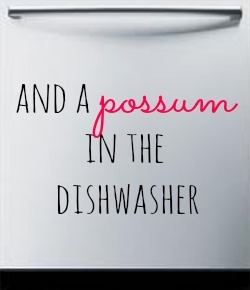 How ironic that he had brought an opossum, the least attractive of animals but among the sweetest, who just go along their way, eating everything and cleaning up the world. Sometimes I think we get in our own ruts and form opinions that build fences that keep out the good things. Just like the little ‘possum, this man was a shining jewel inside a worn out box. Love lives inside the most unattractive of God’s creatures. That man was certainly my lesson for the day and shame, shame, shame on me for needing it!